Well, I don’t want to give up so soon, so in this case I’m going to have to make a compromise to keep this thing going. So here are inadequate but necessary catch-up posts of our travels from the end of this year. I’ll try to be better going forward. This was our big trip of the year and our first attempt at extended boondocking. 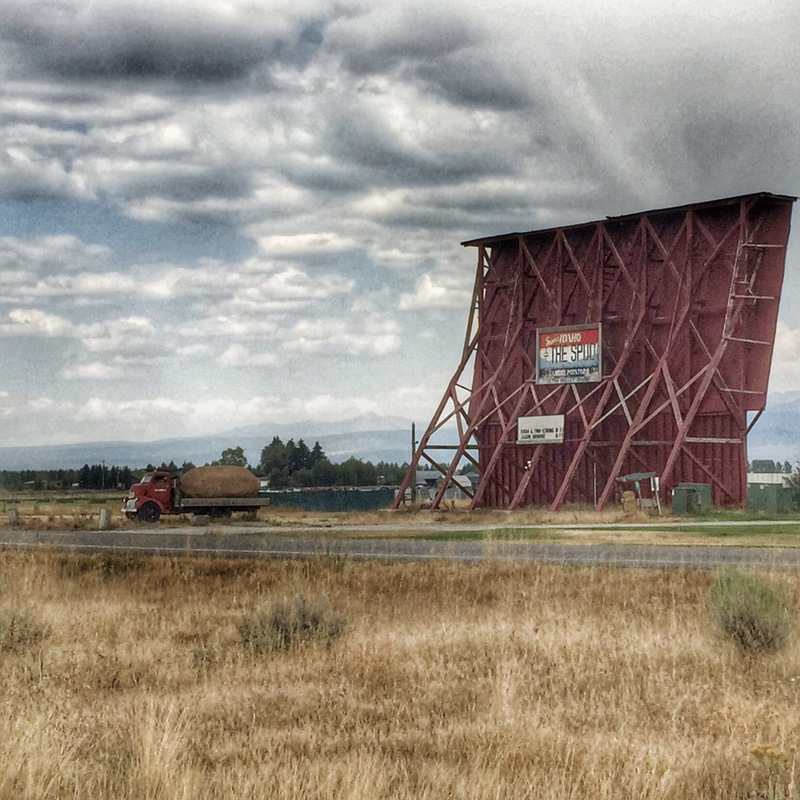 We started off with a week in far eastern Idaho, in the small town of Victor, just over the range from Jackson, Wyoming. It was a great place to stop and get our bearings. I was really amazed at eastern Idaho, with its mile after mile of rolling fields of wheat and scattered potato farms. It reminded me more of Kansas than the rugged far west. Victor was a very cute little town where not much was happening, which made it perfect. They have a nice main street with a few stores and restaurants to support the limited tourism trade on this side of the Tetons. It feels mostly like a bedroom community for the people who work in Jackson but couldn’t possibly afford the real estate prices just west over the range. 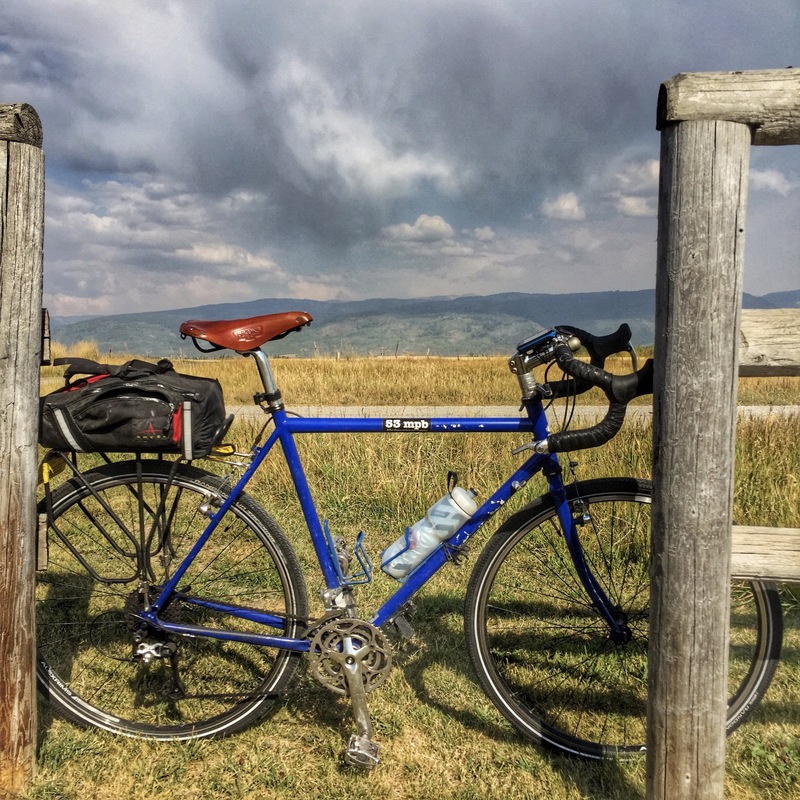 The town supports a fantastic, and for a guy who hasn’t been riding much, wonderfully flat, 7 1/2 mile bicycle trail between itself and neighboring Driggs. It’s a nice ride that lets you marvel at the Tetons without the traffic in the park. Additionally, it takes you by the most Idaho named drive-in possible, The Spud! 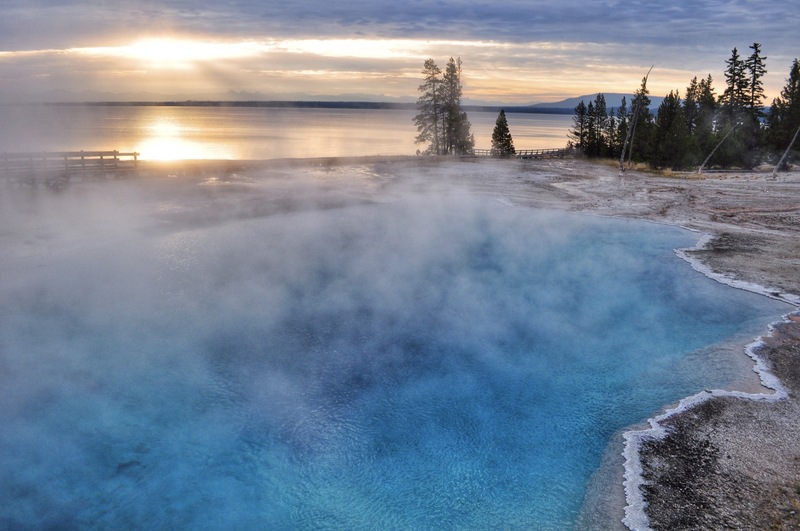 We also started doing our explorations of the Teton and Yellowstone parks. This was both amazing and in it’s own way upsetting. You don’t realize how big these places are when you are traveling out here. Once here, we suddenly realized how much time it would take to really explore these places and how limited our time was for our visit. This is one of the early frustrations we are having on our travels. Due to some obligations back in OKC right now, we have to take short out and back trips which makes our stays seem more rushed and more like a working vacation than a working adventure. We will both be glad to have some longer stints in areas to get a chance to dig a little deeper into the places we visit. On our first day of exploration, we certainly hit the wildlife jackpot. In one stop at Blacktail Ponds at dusk, we spotted within about a three-minute window: mule deer, a massive elk herd, moose and a red fox. Plus we were presented with an astounding sunset over the mountains. The next week, we crossed over into the Wyoming side of the Teton, snagging an amazing boondocking spot at the aptly named Upper Teton View. You can read our in-depth review here. It was sometimes hard to work with this view presenting itself. My mother joined us for a week and a half for this part of our trip which allowed Grace and her to do some exploration during the week while I worked. This was also our first test of our ability to do long-term boondocking. Overall we did well, though we did run out of drinking water on one day and were forced to run to the dump station a few days before we moved out. Once we have the composting toilet installed, I think long-term stays will become much easier. My mother and I had a really nice long photo trek through Yellowstone on Labor Day weekend. Yellowstone really wasn’t as packed as I would have expected, but there certainly were a lot of people around. The best part of the exploration was getting to West Thumb right before dawn. The place was almost completely deserted except for a couple of intrepid photographers there to capture the golden dawn light. As we were tramping around, we kept hearing nearby bellowing from a male elk. All of the sudden, two females came galloping at full tilt through the geysers followed in close pursuit by a male, in pursuit of a mate. These are the moments I think I most look forward to having on our trips. The sights are great, but this was a moment that was purely mine, a trapped memory to keep and revisit. 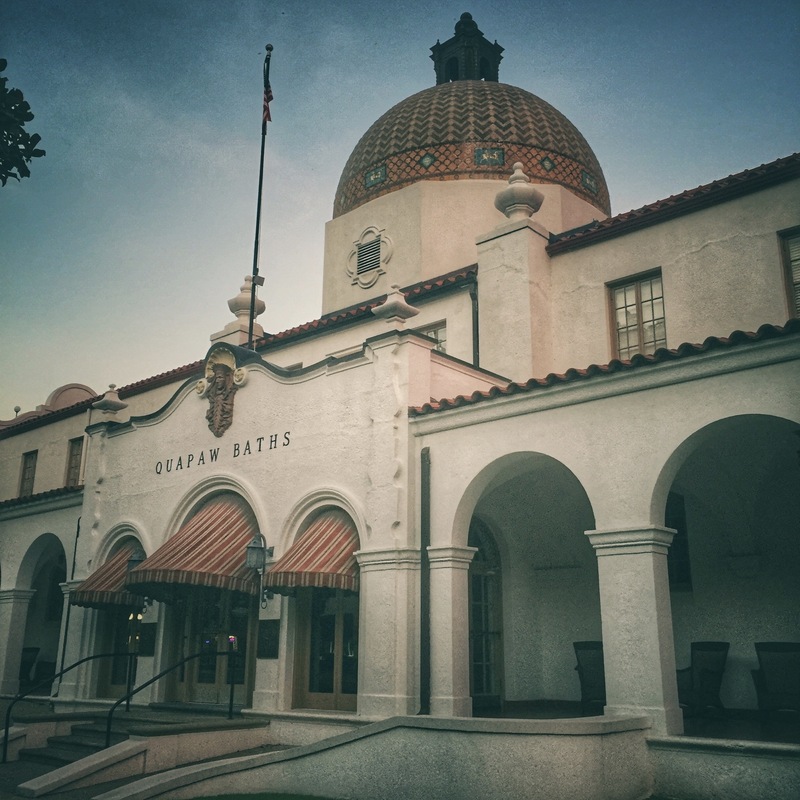 We started off in Hot Springs, which is an astoundingly odd National Park being that it’s a park that is really mostly a city with grand 19th century boulevards and amazing turn of the century architecture in the grand bath houses. The whole place has an amazingly weird feel to it with old-fashioned tourist trap shops (magic stores, houses of wax, t-shirt shops specializing in vulgar clothing, etc.) along with the old architecture including crumbling 15 story former grand hotels and with amazing levels of extreme poverty as well. Not sure exactly what to make of the place. Maybe best described as an interesting combination of contradictions. We did make sure to get a bath. Not sure it cured me of any particular ailments, but it was certainly a relaxing experience. 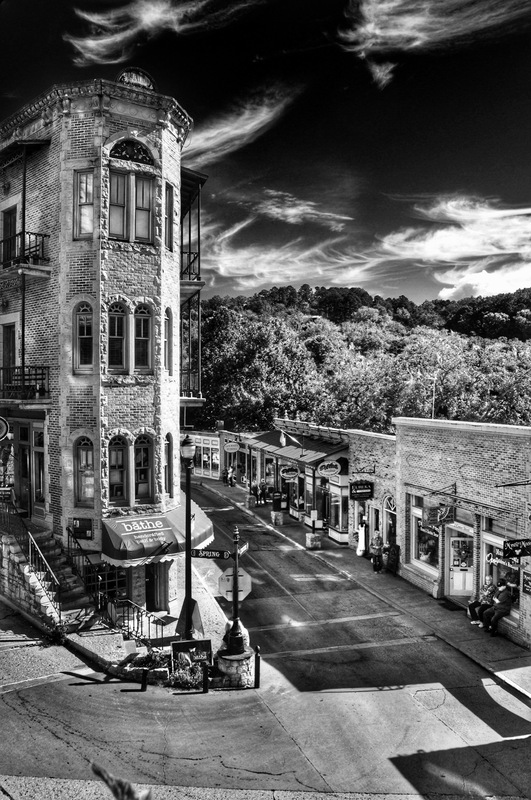 We then moved over to Eureka Springs for a week. A far more prosperous tourism community which felt almost artificial in some ways after the grittier Hot Springs. However, it was a nice way to finish out our big travels for the year. We had some great photo walks through town and generally enjoying some last moments on the road. 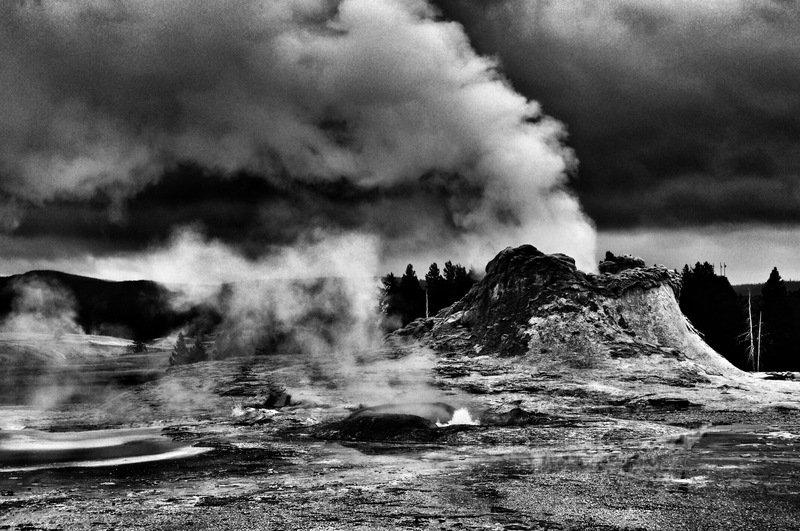 You can see the full gallery of Yellowstone photos here. And a small gallery from Hot Springs / Eureka Springs here. Your travels look great so far! Seems like a good compromise if you need to return to Oklahoma regularly. As you can see, a month in a place is barely long enough to establish a working setup. Don’t be afraid to hang out! We don’t have cultural norms yet for both visiting and living in a new place. That makes it an interesting subject to read about. Happy new year! Thanks. You are right, it’s a tough balance to make sure to have the time to explore while working on the road. Did you ever feel you came to a right time frame balance during your time on the road? We are certainly glad for the chance of adventure and can’t wait to try the experiment here again soon! In retrospect our best spots were small RV parks where we paid monthly, got all our resources lined up, then explored the area from that base. They weren’t always the most scenic spots, but as you’ve found scenery doesn’t always help you work. Having it close but not in front of you might actually be better sometimes! Two months in a spot seems like a good balance to me.